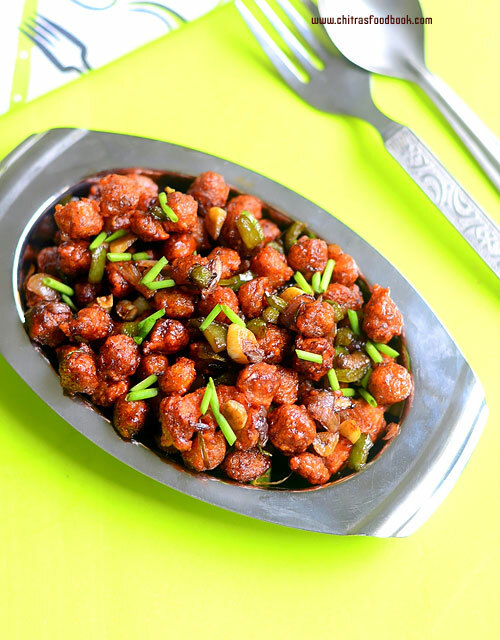 How to make Soya chunks manchurian/ meal maker manchurian – Dry version with step by step pictures ! 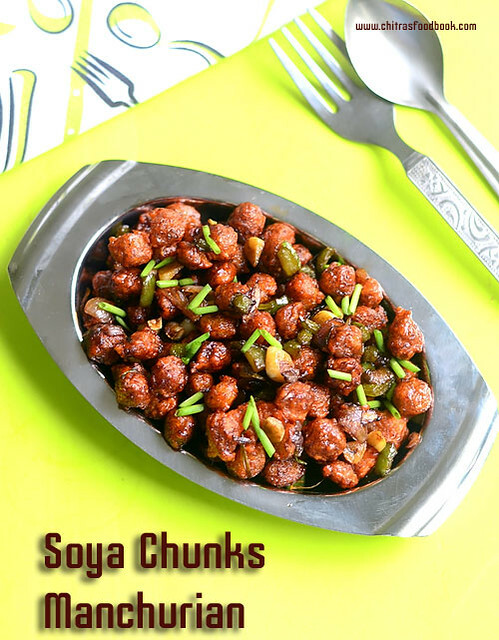 Soya chunks also known as meal maker & soya nuggets is a good source of protein for vegetarians. Usually I add them in biryani. Recently I bought a pack of mini soya chunks(Soya chunks nano) to try some curry or gravy with it. But I got tempted to make soya chunks Manchurian after watching Vahrevah Youtube video. Soya chunks fry came out very crispy like Gobi 65 and tasted great when hot.I made a dry Manchurian sauce and it stayed crispy for sometime even after adding in gravy. But It became slightly chewy and soft after its cooled down. So make and serve it hot to enjoy its actual taste because the moisture content inside the soya chunks makes it soft soon. Use mini soya chunks for best results.If you use big sized soya chunks, chop it after soaking in water to make a crispy fry. Do try this for your kids. I am sure they will love it. Lets see how to prepare Soya chunks Manchurian also known as meal maker Manchurian with step by step photos ! Boil 3 cups of water and add the soya chunks in hot water.Let it soak for 10 minutes. It becomes soft and doubles in size. Squeeze the chunks and drain the excess water( If using big sized soya chunks, chop them into small pieces after squeezing the water).Take them in a bowl.To this, add maida, corn flour or rice flour ( OR use 50/50), red chilli powder, g&g paste and required salt. DO NOT ADD WATER. Just mix everything well. The moisture content of soya chunks would be enough to coat the flour. Add more flour if the chunks are not coated properly. Make sure the flour is well coated over soya chunks. Let it rest for 10 –15 minutes. In the mean time, finely chop the garlic, big onion, spring onion and capsicum. Set aside. Prepare sauce mix first. For this, take red chilli sauce or chilli powder, soya sauce, tomato sauce, sugar and salt.Mix well. Heat oil to deep fry.Drop one soya to check the heat of oil. If it rises to the top immediately, oil temperature is just right. Reduce the flame to medium and drop a batch of soya chunks in a sprinkled manner in oil. Keep tossing them for uniform cooking. Fry them until the bubbles cease and soya chunks turn golden brown with a crispy texture. Remove in a tissue paper. Repeat the same and deep fry all the chunks. If you wish, you can serve this crispy, fried chunks as soya 65 with tomato sauce. Kids would love it. If you want to make manchurian, proceed to the next step. Heat oil in a kadai and when it gets heated, add the finely chopped garlic, big onion, spring onion and capsicum.Saute until onion turns transparent. Add the sauce mix. Add little water if needed.Mix well and check for taste. Add more tomato sauce or red chilli powder as per your taste. Add the fried soya chunks.Toss well and remove in a plate. Garnish with finely chopped spring onion or coriander leaves. Serve hot immediately ! You can replace corn flour with rice flour or use 50/50 corn flour and rice flour. Serve hot to enjoy its best taste because soya chunks becomes chewy and soft after it cools down. 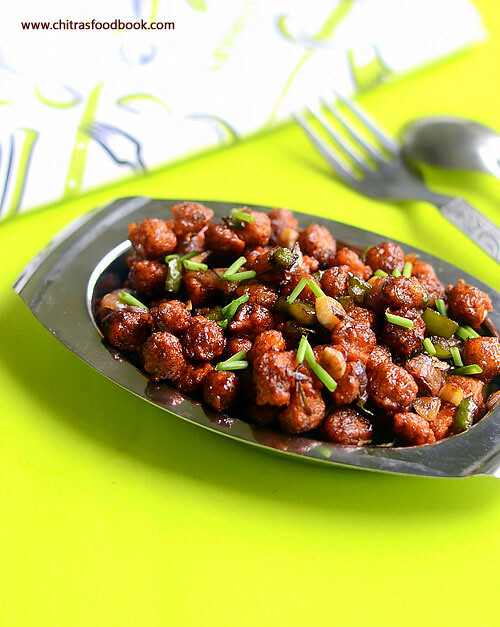 Try this yummy soya chunks manchurian dry at home. You will love it !